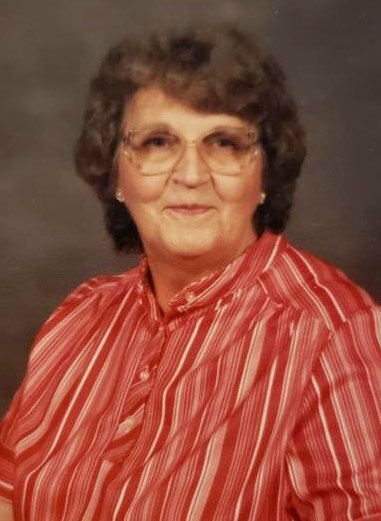 EWING — Freda Mae Webb, 89, passed away Thursday afternoon, April 11, 2019, in Benton. She was born May 11, 1929, in Spring Garden, the daughter of Homer and Alma (Johnson) McCann. Mrs. Webb was a loving wife, mother, grandmother, great-grandmother and sister. She worked for many years at Burton's Café in Whittington. Mrs. Webb is survived by her five children, Charles R. Webb and fiancée, Debbie Antill, of Ewing, Charlotte Brown and husband, Darrell, of Sesser, Linda Holman and husband, Clay, of Ewing, Carolyn Zettler and husband, Rodney, of Sesser, and Brenda Witcher and husband, Rick, of Sesser; 11 grandchildren; 20 great-grandchildren; sister, Ruth Endsley and husband, Ed, of Benton; two brothers, Carl McCann and wife, Mary, of Christopher, and Jerry McCann and wife, Mary Ann, of Benton. Mrs. Webb was preceded in death by her parents; husband; by a brother, Junior Ray McCann and his wife, Peggy; and by a sister, Wastina Campbell and her husband, Byford. Services will be at 1 p.m. Monday, April 15, in Johnston Funeral Home in Ina, with the Rev. Ed Endsley officiating. Burial will be in Williams Chapel Cemetery in Ewing. Visitation will be after 11 a.m. Monday at the funeral home. For more information or to send online condolences, visit www.johnstonfuneralhome.com.